Athens Administrators has been voted one of the Best Places to Work in San Diego by the San Diego Business Journal. The program was open to all public and privately-held organizations with facilities in San Diego and a minimum of 15 employees. Nominees were judged in the categories of nonprofit organization, business nonprofit, education, family-owned business, government agency, privately held company and public company. 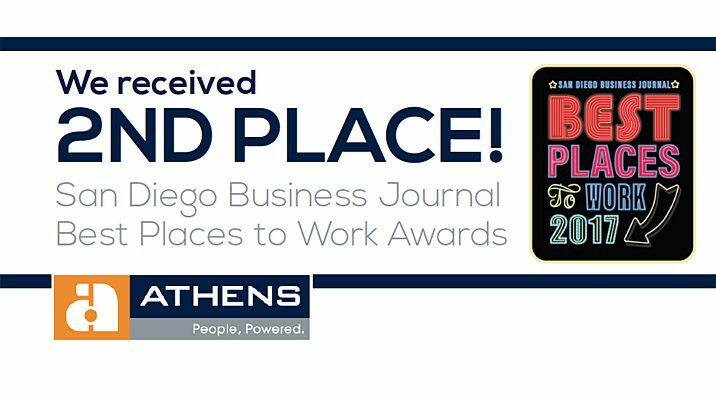 Athens was ranked the 2nd best place to work and acknowledges what a great honor to be recognized as a “Best Place to Work in San Diego”. At Athens, our people are the foundation for everything we do. We are “People Powered.” Providing a great place to work is one of the foundational core values of our company. Our environment is one of our keys to sustained success. We are a customer service company. When we all operate within a fulfilling and respectful environment within our organization our clients and their employees will be treated in the same fashion. This drives client satisfaction, delivers outstanding retention levels and positive referrals. Founded in 1976, Athens Administrators delivers superior workers’ compensation and liability claims administration services and support with the highest level of personalized attention. We are a full service, customer-centered organization dedicated to creating value and delivering results. For more information about Athens Administrators, please click here.